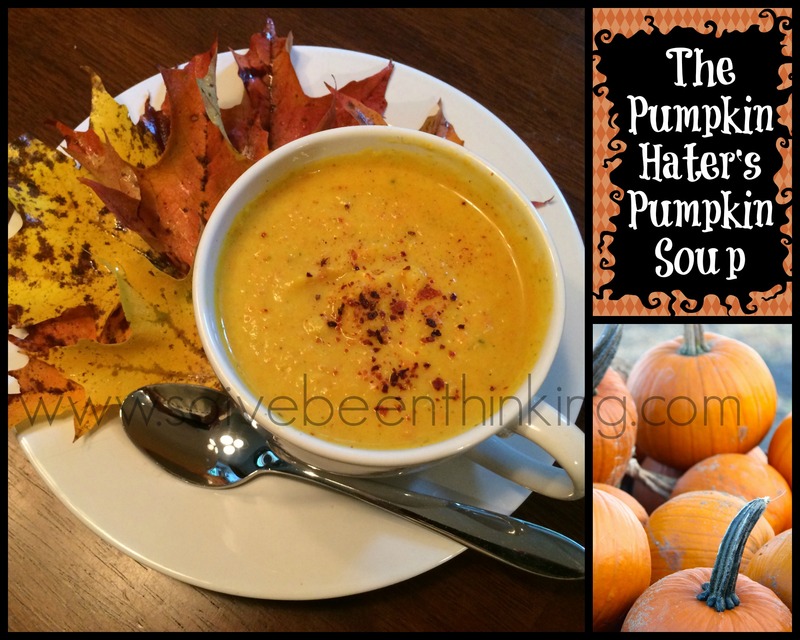 The Pumpkin Hater's Pumpkin Soup - "So, I've been thinking..."
Iâ€™ve never been a huge fan of pumpkin. I donâ€™t like pumpkin pie or pumpkin rolls, that whole traditional flavor profile â€“ cinnamon, nutmeg, clove, allspice â€“ itâ€™s just not something I find delicious. Imagine my surprise then, when I tried making a savory pumpkin soup and I loved it. Like invite friends over for â€œthe best soup everâ€ loved it! Last year a friend noticed the beautiful sugar pumpkins decorating my windowsill and asked what I was going to make with them. â€œIâ€™ll bake the seeds at some point,â€ I said, â€œIâ€™m not a big fan of pumpkin.â€ She went on to rave about a pumpkin soup she had made and after hearing it didnâ€™t contain a single one of those spices I was willing to give it a try. That soup was good. And true to my nature, I barely followed the recipe â€“ I added many additional ingredients and played around with the texture. After reviewing another recipe from a different friend Iâ€™ve developed my own pumpkin soup recipe. This is a recipe, so simple and delicious, that I will follow (roughly) every time I make pumpkin soup from now on. Iâ€™m not a strict cook, meaning (as Iâ€™ve already mentioned) I donâ€™t follow recipes to the â€œT.â€ I read them through, think about what I like, maybe look up a few more for additional ideas and do some combination of everything. This pumpkin soup recipe is just that, it starts exactly how I make chicken soup and integrates steps from my favorite mulligatawny and then some steps from both of the recipes I was given. This recipe is flexible, feel free to make it your own. My one suggestion is to keep some â€œdairyâ€ in it. If you donâ€™t want the cream cheese, experiment with plain Greek yogurt, heavy cream, sour cream or half n half. You can start with a little and add more to taste but it helps hold the soup together and gives it a creamier texture. Thatâ€™s it. Itâ€™s pretty simple, even with roasting the pumpkin yourself. If you try it, let me know how it turns out. If you have other ingredients you added let me know that too. Good luck and have fun! Scary Year, Scary Pictures, a Photo Contest Entry! That’s pretty funny! My husband cooks here the majority of the time but he just can’t do soup like I can. Let me know how it turns out! Yum! I don’t like cabbage and yet I like cabbage soup. So I bet I will like this too, even though I don’t like pumpkin. It looks really good. And since you made it, I know it’s good! Pinning! PS. I love your picture! Thanks Michelle! You should definitely try it, it seems like something you would like. It’s very fresh and if you like any other kind of squash I’m going to say you will. I think pumpkin gets ruined with those other seasonings – it’s getting a bad rap! I LOVE pumpkin soup. LOVE it. I’ve never, ever made it, though. I feel like I could do it, reading the recipe. It made me smile when you said you played around with it…obviously! Hahahaha. I cannot imagine the inedible horror that would result from me playing with any recipe. Heck, I can barely produce decent things by following a recipe to a T. I’ve got no business winging it! Hi Lisa! I’m bad with recipes in that I just can’t follow directions!! The most difficult thing here is roasting the fresh pumpkin and it’s so crazy good my daughter and I kept eating the pumpkin right out of the shell. This is almost a no-fail recipe you should definitely try. So do people always ask you how can possibly not like pumpkin? Especially during the Fall season when everything is pumpkin? This soup looks so delicious, I am absolutely going to try it! I do have a lot of people who don’t understand that for sure. I guess it turns out I actually do like pumpkin I just don’t like those spices together. Weird. One of the soup recipes called for brown sugar – I didn’t even go there for fear of ruining a good thing. I’m glad you are going to try it – let me know how you like it! This sounds delicious! I have making pumpkin soup on my fall “bucket list,” and I’ve been on the lookout for a good recipe. Do it!! Don’t even hesitate – this soup is that good!! I was very excited to see the recipe the same day I had finished the batch you generously gave me for lunch!! The recipe looks so simple, but the results are nicely complex. Thank you!! I just finished mine, too! I’m going to have to make more this weekend, you know – because the ‘rents are here. Looks good – it’s the curry that makes it for me! Me too, Janet. One recipe called for 1t of curry. I was like…what? I won’t even taste that! I’m the 3T cook for sure. Miss you – hope you are well! I adore pumpkin soup-yum!-but have always made and eaten the sweetly spiced versions. I am intrigued by your savory version and am pinning it to try when the weather cools down shortly. Thanks! It’s very different and a little spicy but really delicious. I’ve made it 3 times since I posted this. I might have to try this one… I’m not a fan of pumpkin, either. Not even pie. But I love soup and am always willing to try something new. You’ll have to let me know how you like it then. I’m always hesitant to try pumpkin anything because of that sweetness but you’ll find none of that here. You should totally love this then, roasting those sugar pumpkins…they were so good I couldn’t stop eating them. I love pumpkin – and I also can’t resist anything with cream cheese. I will go with the 8 ounce suggestion – thank you! I hope you love it. I just made it again for my parents and added a little extra cream cheese – so delicious!! Hi, swinging by from SITS! This looks delish, sriracha and curry?? Sign me up! Gonna have to try it for sure! Thanks so much for sharing this!